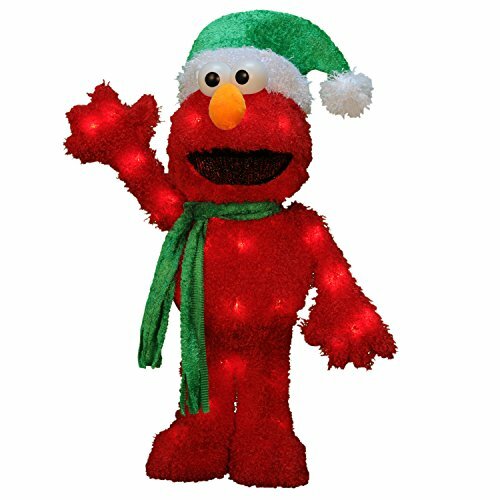 Proudly show off your Christmas spirit with the ProductWorks 18-Inch Sesame Street Pre-Lit Waving Elmo Christmas Yard Decoration. This yard statue featuring the classic Sesame Street character, Elmo, wearing a green Santa Hat, waves to guests to spread holiday cheer. Pre-lit from within, the statue has 35 clear mini lights that illuminate it with a holiday cheer. The sturdy steel form is covered by colorful, red faux fur for a classic, whimsical look that makes any home feel festive. Great for indoor and outdoor use, the Sesame Street Waving Elmo Christmas Yard Decoration comes with ground stakes and spare bulbs to secure the statue and ensure it's always shining a little light in the neighborhood. Measures 18" L x 7" W x 8" H.
Measures 18" x 7" x 8"